I love wandering the internet, exploring all the great ideas others bring to creating recipes. Yesterday I had started Crispy Slow Cooker Pork Carnitas in the morning, but didn't want to just wrap it in a warm tortilla this time around. One site I visited talked about making a hash concoction with carnitas meat and some general ideas of what ingredients to use, so last night I decided to give it a go and was pleased overall with the results. While I may explore and change this recipe over time, here is my starting point. I have at two recipes on this blog on how to make Pork Carnitas meat - and there are many more out there - but my go to one for ease is the crock pot version. 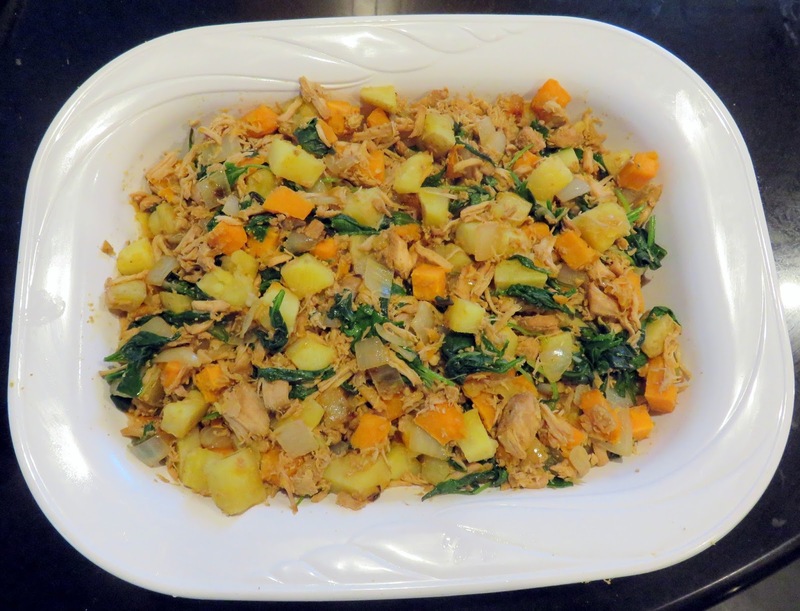 You dump everything in, let it cook to tender, shred and then spread on a cookie sheet and crisp under the broiler. If in a hurry you can skip the crisping step - I often do - but it's not quite as good. For the eggs - the suggestion is to cook them with the yolk a bit runny, so that leaves you with poached, sunny-side up or over easy. That said, if you have someone who doesn't like their egg yolk runny, you can easily make theirs to order. Pre-heat over to 350 degrees. Toss potatoes and yams with just enough olive oil to coat. Spread on a lightly oiled or Pam'd cookie sheet (I like to cover my cookie sheet with foil first to protect it and then oil). Spread the potatoes and yams in an even layer and roast in over 40-45 minutes, just until done. 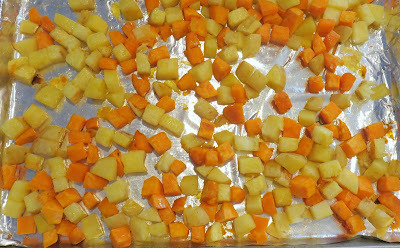 You don't want to overcook them as the yams in particular will get mushy. I would gently turn them with a spatula at least once part way through to prevent sticking or browning too much on one side. When the potatos are finished, remove from oven and turn the oven off. Gently combine the potatoes with the meat mixture in a heatproof casserole or bowl, season to taste with salt and pepper, cover with foil, then place in the oven to keep warm. You really don't want this to cook further, so if you're not serving right away - leave on the counter until serving time and then gently reheat in a low oven. To Fry eggs - Wipe out your frying pan and add a small amount of butter (or oil if you prefer). Gently cook one egg per person to either sunny side up or over easy. To Poach eggs - directions HERE. Set out your serving dishes - plates or large meal-size bowls. 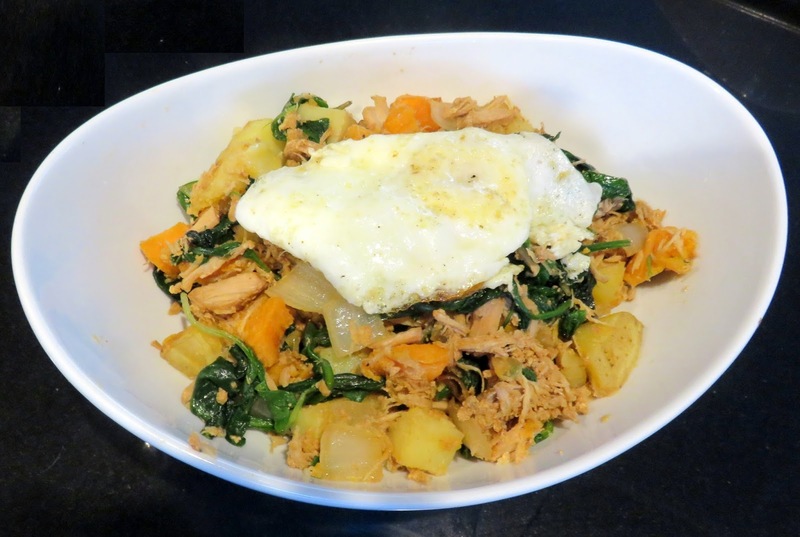 Take your warm hash out of the oven, Place a large helping in each dish and top with one egg. Dinner (or breakfast or brunch or lunch) is SERVED!